The most common way to make essential oils is by extracting directly from the plant. Learn how to make essential oils in 5 different ways right in the comfort of your home in this blog post! Essential oils are nurturing and rejuvenating gifts we can extract organically from nature. It comes from the leaves, stems, flower buds, and even from the dried fruit of plants. In history, it is considered as the essence of a plant, an aromatic organic compound that we still enjoy using at present. There are many ways to extract essential oils. This quick guide will help you extract your first manually-produced essential oil. Fill a crock pot with distilled water enough to soak your herb, flower, or leaf of choice. Cook on low heat for at least 24 hours. Remember to cover the pot during the whole 24 hours. After cooking, leave the crock pot open and allow it to sit for a week. Oil will be evident on the surface of the mixture. Carefully collect the oil and store it in a dark glass container. Use a piece of cloth to cover the essential oil. Leave it for another week to allow excess water to evaporate. This essential oil can last for about 12 months. Another method to make essential oils include placing your preferred plant inside a cotton or linen bag. You can also use a cheesecloth or a white cloth to tie down your base ingredient. Place it inside a pot of boiling distilled water. Simmer it slowly for a day. Just like the first method, oil will be released on the topmost portion of the mixture. Squeeze the bag and then collect the oil on top of the water surface. 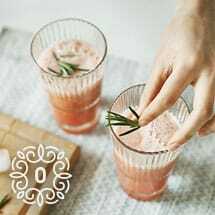 You will need to place it in a dark glass and allow excess water to evaporate for a week. This essential oil can last for a year. Half-fill a clear glass bottle with your preferred carrier oil (olive oil, almond, grapeseed, or jojoba). 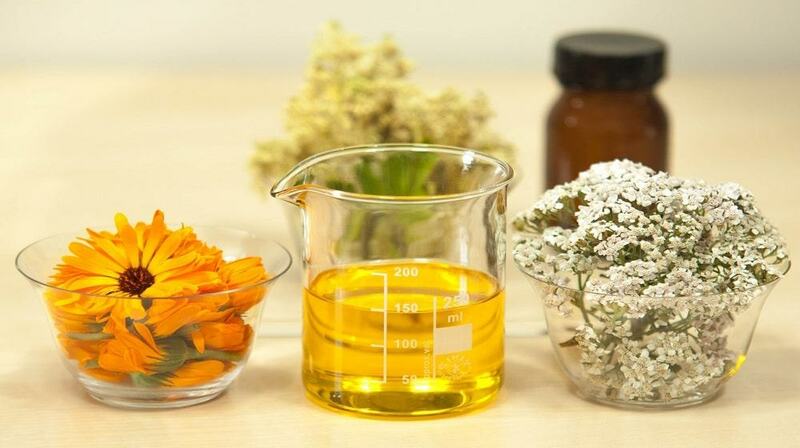 Mix the flower or herb you would want to extract oil from as much as the bottle can handle. Cover it tightly and let it sit in a dark and cool corner of a room. Leave it there for 24 hours or more. After 24 hours, shake the glass container, then let it set for another day. Repeat this process for 3 days. Using a cheesecloth or a white cloth, strain the mixture and transfer the essential oil in another dark glass container. This type of essential oil can last for 6 months. 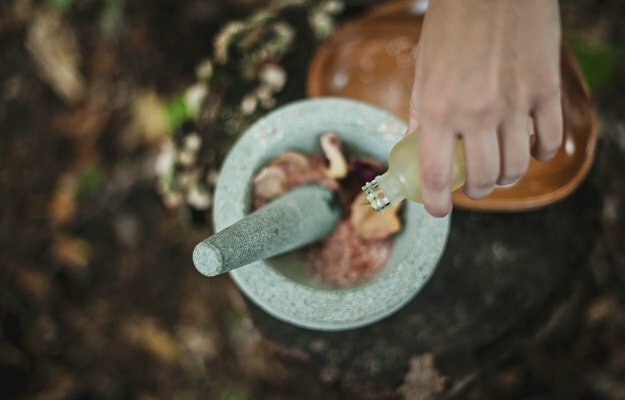 Grind your preferred herb or flower with a mortar and pestle. Mix 1 tablespoon of this material with half a teaspoon of white vinegar and your preferred carrier oil. Put it in a clear bottle, cover and then place it in a warm, well-lit area for three weeks. Shake it twice daily. Do this process for 3 weeks. Separate the essential oil from the mixture by straining it with a white cloth. Place the liquid in a dark glass container. This essential oil has a shelf life of 6 months. Mix your preferred plant material together with a bottle of rubbing alcohol in a clear glass. Let this mixture set for 2 weeks. After setting it aside, pour the mixture into a wide container or a pot. Set it aside until all the alcohol has evaporated from the mixture. Collect the essential oil and then place it inside a dark container. This essential oil can last for 6 months. You can create a lot of different scented essential oils with the methods mentioned above. There are faster and mechanical ways to make essential oils. However, if you prefer doing it naturally and enjoy the experience, spend the weekend by starting your first essential oils project. You will be surprised and impressed with the results! What’s your preferred method of extracting essential oils? Share your experience in your comments section!